Beets can be dangerous. They look kinda funny before they're cooked, and once cooked, they dye everything a deep crimson. But they taste GOOD! Amanda Hesser, of Food52.com, shares her perfect method for roasting beets. The trick? Foil packets. I followed the instructions exactly with great success. Fair warning, my hands (and everything in my kitchen) were dyed a beautiful, beety red after I peeled the skins. Lightly drizzle olive oil on thick crunchy bread, and place in oven at 400 degrees for about 5 minutes. Remove and top with a thick slice/spread of goat cheese. Please under broiler for about 3 minutes. 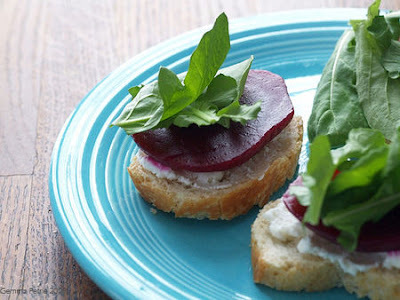 Place beets on top of toasts. Top with arugula leaves and drizzle with favorite balsamic vinaigrette.